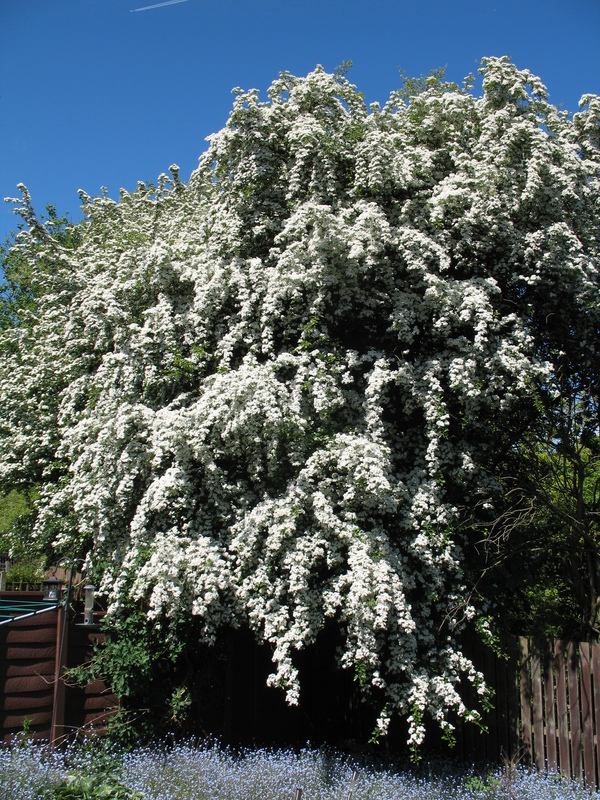 The hawthorn tree at the bottom of my garden has burst into bloom, just a few days before the end of the month of May. So I’m hoping that I can safely ‘cast my clouts’. Although it looks very pretty the scent is powerful and after a while becomes slightly unpleasant as it has a whiff of decomposition. The reason is probably that the flowers are fertilised mainly by carrion insects who would normally lay their eggs in rotting flesh, and the tree has acquired that smell to attract them. Rural villagers in the middle ages thought that it held the smell of the Great Plague of London. There are many myths and legends associated with the hawthorn. Because it flowers in the Spring it is associated with fertility. But if you place its leaves under a pillow or scatter them around a bedroom it will enforce or maintain chastity and celibacy. Hawthorn is associated with both good and bad luck. A branch of hawthorn over your door will ward off evil spirits. Hawthorn will also protect you from lightning and protect your house from damage by storms. But do not bring the flowers into the house or someone who lives there will die. If it is worn, or carried, it will promote happiness in the troubled, sad or depressed. Fishermen should also carry some hawthorn to ensure a good catch. It is also associated with fairies, especially in Ireland. The hawthorn is sacred to fairies and is part of the fairy tree triad of oak, ash and thorn. Where all three trees grow together it is said that you may see fairies. But bad luck will follow if you dare to disturb a ‘fairy thorn’. In 1982, workers in the De Lorean car plant in Northern Ireland claimed that the business had so many problems because a ‘fairy thorn’ had been disturbed during the construction of the plant. Apparently this claim was taken so seriously that a new one was planted. Lovely to see your hawthorn tree and to read more about the history and legends. The hawthorns beyond our garden are also in full blossom. Beautiful! Previous Should I drink this?